Completion of your thesis will require attention to paper type, printing and binding, before submission for examination, and final deposit. Your thesis needs to be temporarily bound in a soft binding bound before submitting it for examination - Examination and Assessment Regulations 2014 , s.14.2(a). This is so that you can make any required corrections before final deposit. For PhD theses, you must provide 4 copies for marking; for other theses, you must provide 3. You must also complete one hand-signed, looseleaf copy of the Thesis Declaration Form to accompany your soft-bound theses. Soft-bound PhD theses – are accepted at the St David II building by appointment only: to book, students should email phd@otago.ac.nz. After checking the candidate’s enrolment details, a member of Student Administration will either confirm the appointment or advise what needs to be completed before submission of soft-bounds can be accepted. Soft-bound Masters theses are submitted to your Department. University of Otago form that must accompany your softbound theses that you submit for examination. Uniprint - following corrections to your marked thesis get your final version printed. If you have printed your final thesis elsewhere, you can go straight to Library Bindery. You can claim a cost waiver or refund for printing and binding the two thesis copies for degree conferral and final submission, provided that you submit your thesis within a specified time – see Examination and Assessment Regulations 2014, s.14.2(c). phd@otago.ac.nz - contact the PhD Office or your department (Masters students). Theses longer than 200 pages, print your thesis double-sided on 100gms paper. Special or coated papers - discuss your requirements with Uniprint and the Library Bindery first. 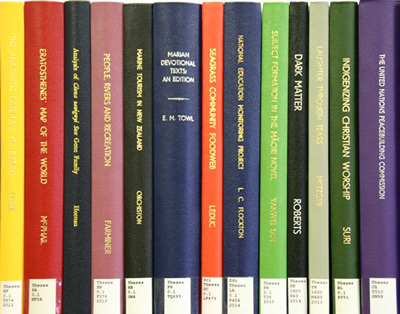 Library Bindery - offers binding services to Otago students completing theses/dissertations, at competitive prices, with a maximum 10 day turnaround. An Otago thesis must be bound in woven cloth (over sewn, rounded and backed) by a bindery. Ensure your pages are in the correct order. Author Declaration Form - insert this before the title page in your bound thesis. Final arrangements - Doctoral students must consult these for their bound print and electronic thesis copies. Masters thesis students must consult these Thesis submission arrangements, as they differ for Dunedin, Christchurch and Wellington students. Where and what do I deposit it? OUR Archive - deposit an electronic copy of your research thesis. Officially recognised research theses will be accepted for deposit. A report of protected material created by others, contained within your thesis. Detailed evidence indicating the permissions given to use protected material created by others, in your thesis. Additional material you wish to make available electronically with your thesis. Be aware of potential publication contract restrictions with making your thesis fulltext openly accessible in OUR Archive. Deposit in a non-commercial repository such as OUR Archive is usually permitted. Level of access can be altered retrospectively to abstract only. Consider this advice on publishing offers. Watch this video to find out if your degree requires you to deposit an electronic version, and what the depositing steps are. Thesis Workflow Diagram - your electronic thesis passes through several stages before it can be viewed through OUR Archive. Oral examination - taken by PhD thesis students after submitting their thesis. For those enrolled from January 2014 this PhD thesis defence is mandatory. The Convener of Examiners sets up this oral examination for you, also known as a viva. The examination takes place after receiving the examiners' thesis reports. Check for procedures with your supervisor.